Everyone loves a good charcuterie board, and what’s not to love? They’re a great (and easy!) way to entertain, and your guests get to pick and choose what they want to eat. 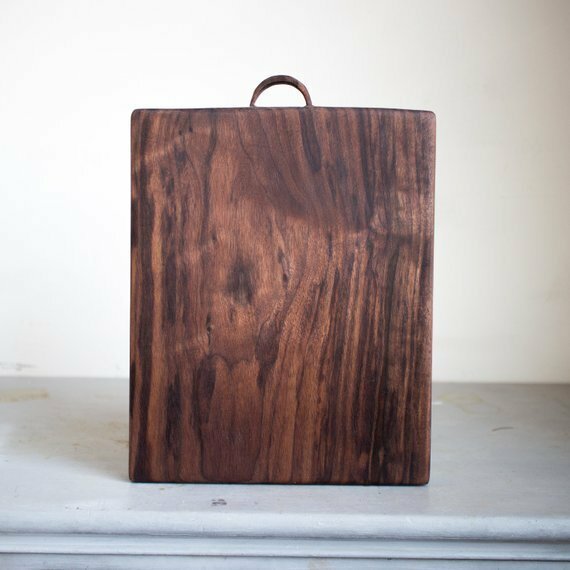 But to serve charcuterie, you need a beautiful board, and thankfully, there are all kinds of styles to choose from! 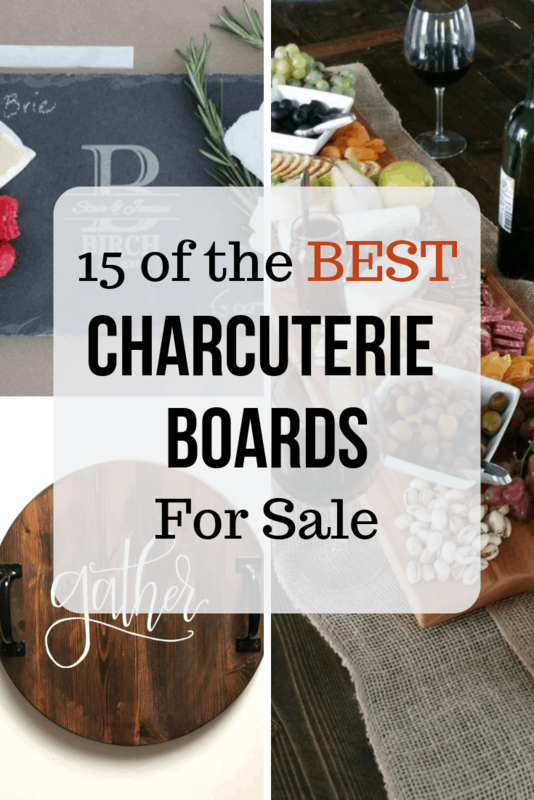 Today I’ve gathered 12 of the best charcuterie boards for sale on Amazon and Etsy. 42 of the Best Homemade Charcuterie Ingredients! 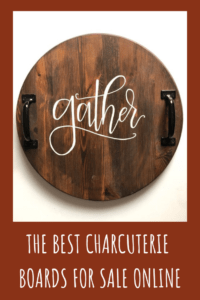 And download my FREE Charcuterie Cheatsheet below! I’m sharing charcuterie boards on Amazon and Etsy because theirs are legitimately the best I’ve found on the internet. Amazon I love because, hello — free 2-day shipping with Amazon Prime! And I love the charcuterie boards on Etsy because they are handmade with quality workmanship. 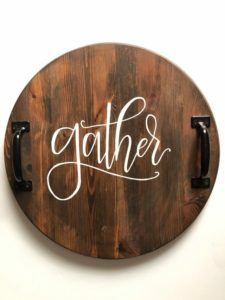 You’re going to LOVE these boards! I can’t wait to show them to you! 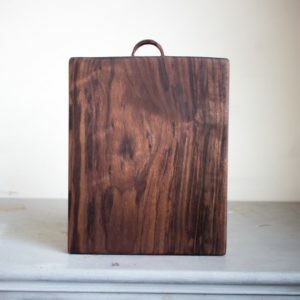 Reclaimed Pine Charcuterie Board — Made from reclaimed 19 century European wood (how cool is that? ), this is one of my favorite boards. It’s a beautiful piece for your entertaining repertoire. GET IT HERE! — This is one of the prettier slate charcuterie boards I’ve seen, and it comes with both cheese tools and slate labels that you can write on and stick in the cheese (so people know what they’re eating). CHECK IT OUT! Bamboo Cheese Board with Cutlery — This cheese board has a cool design — surprise! All the utensils you need slide out in a secret compartment — plus it gets great reviews. BUY IT! 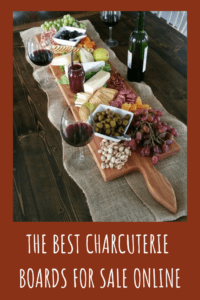 Walnut Charcuterie Board — This is a beautiful piece of wood! I love how wide it is, allowing you to fit a lot of charcuterie goodies on it. CHECK IT OUT! 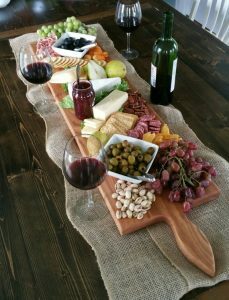 Villa Acacia Live Edge Wood Serving Platter — I love the rustic style of this wooden board, and it’s really affordable. BUY IT HERE! 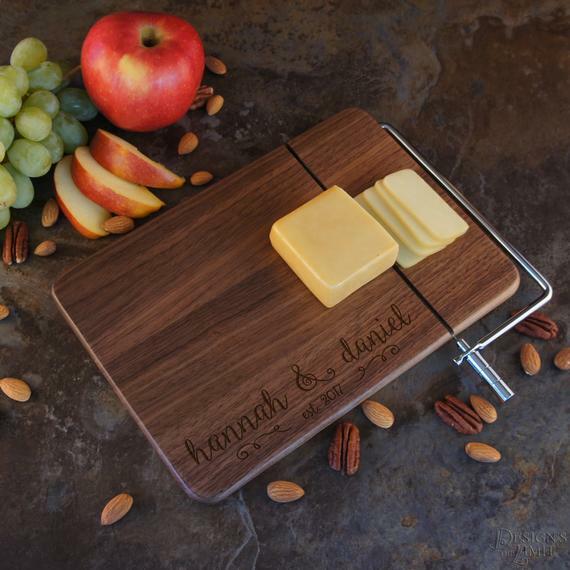 Personalized Cheese Board with Slicer — Want both a charcuterie board and a cheese slicer? This board is both! And you can get it personalized, too. A really unique choice. CHECK IT OUT! Picnic at Ascot Bamboo Spiral Cheese Board — I can’t get over how cool this board is. It folds up to a 9-inch wedge but then doubles in size to 18 inches when you open it up. READ MORE ABOUT IT HERE! 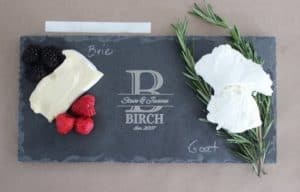 Personalized Slate Charcuterie Board — This slate board is elegant, and you can get it personalized in several different designs. CHECK IT OUT! Gather Serving Tray — I love this beautiful tray. 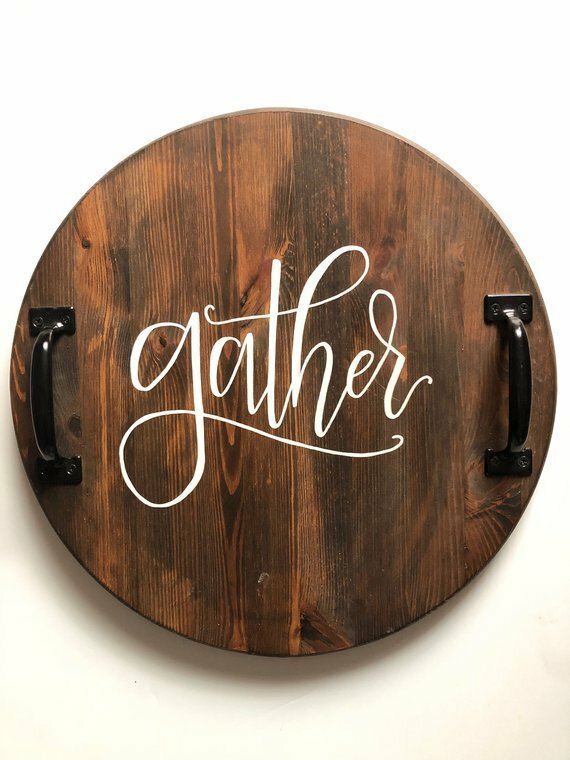 It communicates friendship, and the word, “gather,” is actually handpainted. BUY IT HERE! Marble Paddle Serving Board — This board is simple and elegant. It’s a little on the smaller side but is perfect for one type of cheese and 1-2 meats. CHECK IT OUT! Slate 3-Tier Cheese Tower — This cheese tower is so cool! Think of all the creative ways you can display your charcuterie. BUY IT HERE! Extra Long Charcuterie Board — This board is my other favorite. At 42 inches long, you have LOTS of room to arrange your food. It would look great on your island or on your kitchen table! READ THE REVIEWS HERE! These 12 boards are the best charcuterie boards for sale on Amazon and Etsy. If you’re looking to buy a new one, you can’t go wrong with any of these. I have my eye on a couple — which one are you going to buy? Follow me on Pinterest for lots of great recipes and entertaining ideas! I love the reclaimed pine charcuterie board. I have been looking for one. Thanks for sharing.